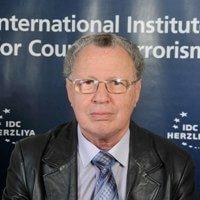 Dr Ely Karmon is a Senior Research Scholar at The International Institute for Counter-Terrorism (ICT) and Senior Research Fellow at the Institute for Policy and Strategy at The Interdisciplinary Center (IDC) in Herzliya, Israel. He lectures on International Terrorism and CBRN terrorism at the M.A. Counterterrorism Studies at IDC. He served as advisor to the Israeli Ministry of Defense and the Anti-Semitism Monitoring Forum of the Israeli Government Secretariat.